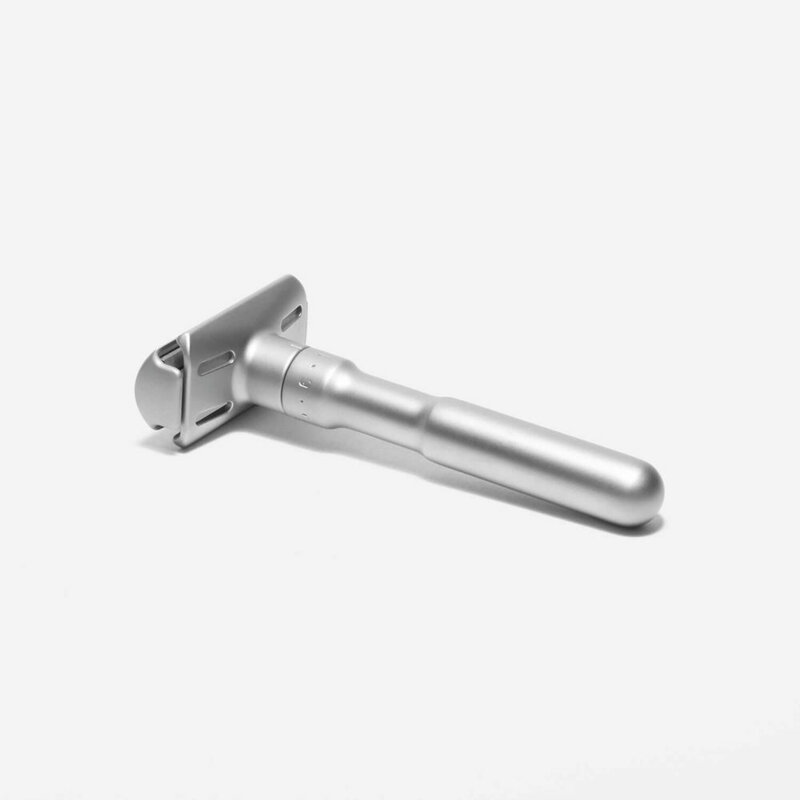 Fully adjustable DE safety razor with a satin chrome finish. 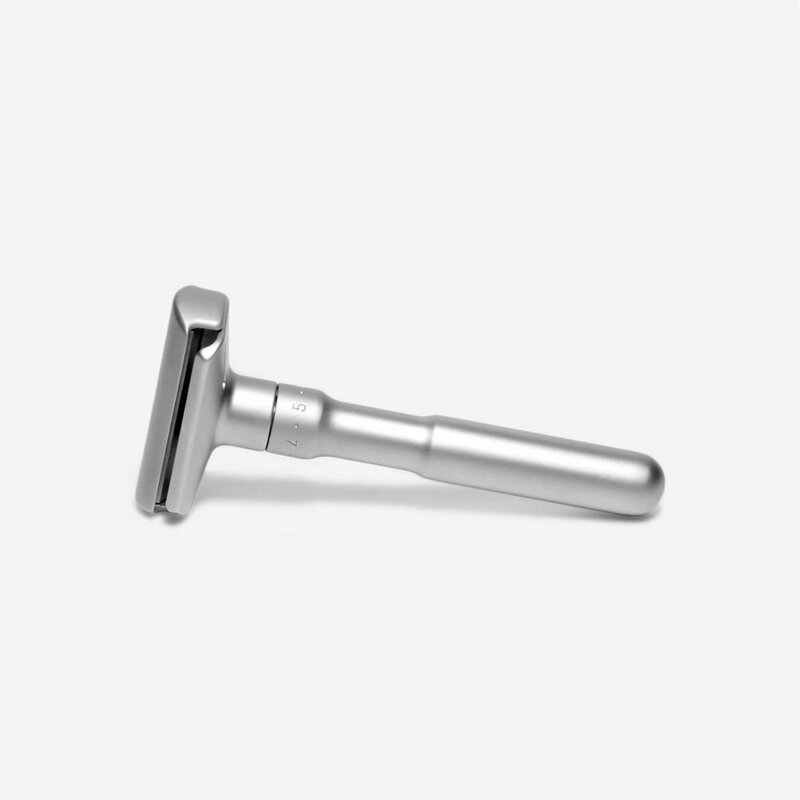 The Merkur Futur is a fully adjustable DE safety razor which allows you to adjust the blade gap and therefore tailor the razor to your beard and skin type. Simply twist the handle to adjust the razor. 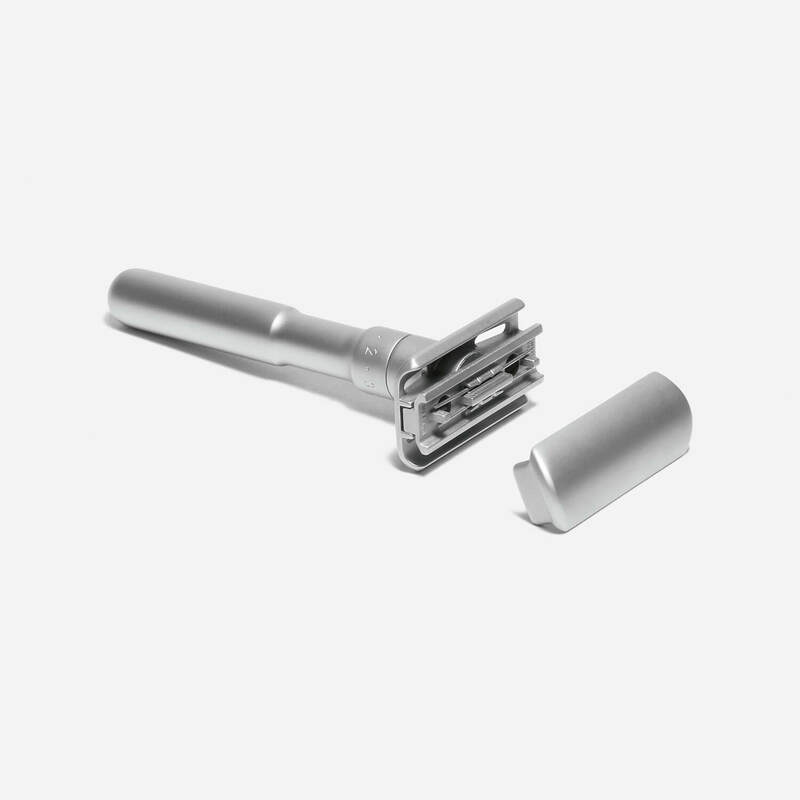 The adjustability makes the razor suitable for both novice* and experienced DE safety razor users. New to DE Safety razor shaving I’m very impressed with this razor. Easily adjusts depending on the length of my beard and the quality is first class, will last a lifetime I should think. Initial outlay can be expensive but it will save in the long run not having to buy the cartridges anymore Mach 3 and such. Plus it gives a smoother shave imho. Excellent service aswell, ordered a couple of bits from Shave Lounge and they arrived next day. After years of putting up with multi blade razors I thought I should try something different. It takes a few days to get used to but I now wouldn’t use any thing else. Gone are the days of tugging blades. An adjustable razor is useful when you you have a light beard (like me). I use my Futur on its closest setting (1). Despite my light beard, I still have the same problem areas as everyone else – just under the nostrils, around the larynx etc. The Futur deals with them all perfectly and far better than any other razor I have owned (and at 62 years old, I’ve tried most). As others say its balance, weight and performance are first class. I recommend it without reservation. A rinse and a re-soap and a second pass against the grain.. removed most of the whiskers..j ust leaving the odd patch or two.. This is my usual method of shaving…. three soapings with a good quality shaving cream and a badger brush… followed by a moisturiser cream……. Yeah I know sissy stuff………..
Just take your time.. might as well enjoy the experience rather than make it the hurried chore it used to be with the muti-blade razors..
One thing I would caution is don’t adjust the razor with a blade in it…. if your grip slips it will slice your thumb like a sausage… either grip the head in a towel or take the blade out…. The razor I have is the shiny chrome one.. and in use isn’t the slightest bit slippery with dried hands….. Excellent Razor.. This is a fantastic razor far superior than the modern Gillette razors. Feels solid in your hand and is very well manufactured. You can’t go wrong with this razor. Got my Futur this week and very impressed with the quality and feel of this razor. Definate plus point is the adjustability! Shave Lounge’s delivery was very quick and good price. This razor is by far the best I’ve ever used, if you’re thinking of switching to a safety razor then I would recommend this. Before using this razor I used to use a 5 bladed Gillette razor and shaving was very uncomfortable. This razor does takes a little getting used to, but I have used it for a few months now and it is definitely worth the price tag, replacement blades are very cheap too. Awesome razor, believe the reviews, it’s better. No more scraping with multiple blade safety razors, that clog up. It’s now a pleasure to have a shave and feel good after. The build quality is second to none and the weight feels good. Can’t say enough good things about the Futur. Just buy it !! After having gone through a few disposables, gillette, bic, etc. I thought I’d try something different. My Dad has had the old school DE for ages, but uses disposables now. But I thought I’d try these new shavers anyway… I just received my Futur today, and just had my first shave a few hours ago…in summary, this thing killed the disposables!!! I have to admit I was very careful, and do admit I did nick myself once, but very small though. I went to a setting of 2.5 (started with 1) and felt comfortable leaving it at that. What else can I say… no razor burn! I thought as I was making the strokes while shaving I would, but none after so I was very happy with that, another thing I tried which makes me happy to write in this review, is that I went against my grain as well… again as mentioned no razor burn. Make sure you prepare yourself well, as you should before any type of shaving… I shave after a shower… I use beard oil/lube, with good cream and keep my blade clean every 2 strokes (As I wanted to make sure it was doing it’s job, being new to this type of shaver). As Chirag mentioned in his review, let the blade do the work for you. Lovely razor; well built and has a very solid feel to it. Gives a first class shave. Would recommend to anyone. Can’t add much to what others have said really; outstanding build quality and first class shave. Would recommend to any man without hesitation. Believe the hype! This is the best razor money can buy. Stunning build quality, super close shave and great value for money when you consider this thing will probably last forever. If you’re looking for a safety razor, you won’t look back from the futur! This is a superb razor and gives an excellent shave. It’s well put together and feels very solid. The blade is adjustable for closeness and I’ve found that this does much better with a single pass than most three blade razors manage. After the initial outlay on the razor, replacement blades work out much cheaper than cartridges too. Better than any cheap disposable or refill cartridge razors, cheaper blades and a better shave, although be careful not to rush, I found that I could sail through with a cartridge razor in no time, this is a better shave but requires a little more time and concentration to begin with. Quality German engineering, nice weight to the razor, it did with one blade what a Gillette Mach 3 Turbo took 3 to do ! Use a good shaving cream with this little gem, Geo F. Trumper, Proraso, Trufitt & Hill etc. use a badger bristle brush or the excellent Italian synthetic from Men-u (save a badger bro’ !!). After using this combination you’ll NEVER go back to cartridge disposable razors again. I can’t recommend this highly enough. It may seem a tad too expensive but, hey, quality costs. Think of all the quids you’ll be saving by not having to buy all those disposables ever again. Outstanding build quality, feels very weighty, and gives a quality shave every time. Bought the Merkur Futur Chrome last month and I love it. Takes a little practice to get used to, but once you have the hang off it, shaving becomes effortless. I’ve never had such a clean, irritation free shave. 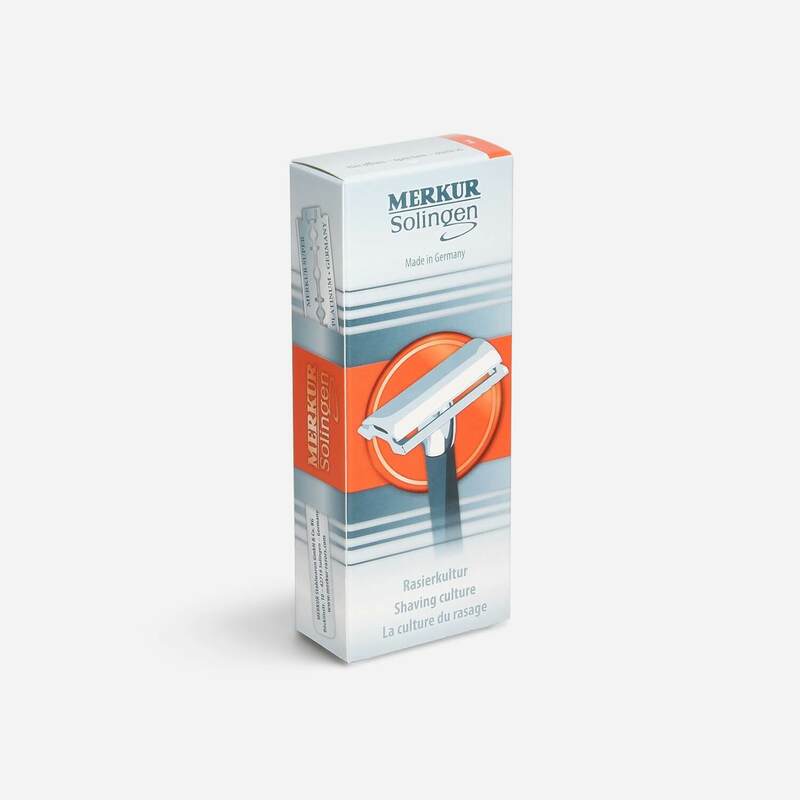 If you’re thinking of a safety razor, look no further than the Merkur Futur! No-one has tried more products and razors than me. Having been frustrated for many a year with my shaves I decided to bite the bullet and buy a Merkur Futur. It takes some getting used to due to the weight but once mastered it’s a joy to work with. You just need to think about it like sawing wood, let the tool do the work and don’t use any pressure! It’s the first time I’ve been able to have a decent shave two days in a row without cutting myself to ribbons. Definitely worth a go! Superb! What a shave!!! Highly recommended for both novice and experienced user. I purchased this razor on the advice of a friend. I was a bit sceptical but once tried I was converted. Merkur have created the ultimate shaving machine. User friendly and well engineered. Do yourself a favour and buy one! I love this razor, gives the best shave hands down. Just remember not to press down on the skin, and use the weight to do the work for you.